David Maisel was born in New York City in 1961 and now lives and works in the San Francisco area. His photographs, multi-media projects, and public installations have been exhibited internationally, and are included in many permanent collections, such as the Metropolitan Museum of Art; the Los Angeles County Museum of Art; the Brooklyn Museum of Art; the Santa Barbara Museum of Art; and the Museum of Fine Arts, Houston, among others. His work has been the subject of three monographs: The Lake Project (Nazraeli Press, 2004), Oblivion (Nazraeli Press, 2006), and Library of Dust (Chronicle Books, 2008). A portfolio of Maisel's work is also available in Daylight Issue #3. Visit http://www.davidmaisel.com for more information. Library of Dust is on view at Von Lintel Gallery through February 27, 2010. NP: Why do you make art, and more specifically why photographs? DM: I make art as a way of thinking, and I work with photography because it can be used in the most conceptual and the most immediately visual ways. Photography provides a link - however tenuous - to reality and the representation of reality that interests me the most. NP: I know that you were also studying architecture during your formal training in photography. DM: I studied architecture at Princeton as an undergrad; I had gone there specifically with that intention. In fact I had been studying architecture even before being at college. I took a very intense summer program at Cornell in architecture when I was still in high school, and it’s just something I had always been drawn to. But the further along I got in my studies, the more frustrated I was with architecture as a medium of expression, and that’s what I was looking for. I wanted to make things. In terms of architecture, I wanted to work with space and to work with light. I felt that the medium itself was too slow to be able to really make things. You could make drawings of spaces, and I did. You could make models of spaces, and I did that as well, and I think that was really instructive. But I could tell that I wasn’t going to be satisfied with the limitations of the medium. Meaning, how often does one actually get to make a building that reflects the actual investigations you have been undertaking? And certainly as a young man, a twenty year old, that wasn’t going to happen at all. So I could tell that I would probably remain frustrated by this inherent limitation to the medium of architecture. NP: How did you come to choose photography as your primary form of expression? DM: I had the good fortune to kind of stumble into taking a photography class with Emmet Gowin, who was teaching at Princeton at the time. I ended up leaving Princeton after my sophomore year and working in an architecture firm in New York, and sort of tested the waters, and came away ever more frustrated. I really questioned whether this was a career path that could satisfy me. I thought about transferring to art school, and I ended up taking some photography classes while I was away from school as well. One day I guess I cut work [laughs], I called in sick, and I was walking around in Chelsea and Soho. Somewhere in those peregrinations through New York I came upon a guy who was selling books from one of the only photography bookstores at the time called A Photographer’s Place. He was selling books on the sidewalk, and there [laughs] on the sidewalk was Emmet Gowin’s first monograph. I picked it up and started looking through it. Even though I had taken a class with him I really hadn’t had much exposure to his work. These were the most expressive photographs. They were just loaded with feeling and with character, and with expression. I just thought: this is it. This is not only the medium that I need to invest myself in, but I also thought this could possibly be the person who I need to study closely with because here he was; a living breathing artist who was making these expressive works of art. When I went back to Princeton I was very intent upon working with him. I don’t know how much he understood how important that relationship was going to be for me. It wasn’t that I wanted to make work like Emmet Gowin, but I wanted to put myself in front of somebody who I thought was making work that had authenticity and character. So I was lucky enough when I did go back to Princeton to intersect with Emmet at a point where his work was starting to dovetail with my own interests. The thing that had always fascinated me in architecture was how buildings sit in a landscape, what is the natural environment versus the human made environment, and what are the porous boundaries between those two things? When is something natural or when is something manmade, and how do we site these human made things in the landscape? Those are the parts of architecture that were already interesting to me. NP: What were your early or formative experiences with the medium? DM: Emmet was working at Mount St. Helens, and he had been there at least several times before I went back to work with him. I basically volunteered [laughs] to accompany him. I think his wife was going to go and then she couldn’t make it, so I sort of said “Hey! How about me?”, knowing he had taken at least one student to St. Helen’s in the past. St. Helens for me was a kind of touchstone for a lot of reasons. Working with subject matter that I could really sink my teeth into, working on a project – a project based investigation – almost as research. What is this place? What’s happening here? How is it different than my expectations? Because of course by that point we had all seen lots of National Geographic pictures of the volcano’s aftermath. What really caught my eye there was the logging industry, and how it was enacting these kinds of changes in the land that were equal in scale to what the volcano’s destructive powers had yielded. Those kinds of markings of industry in the land - the logging industry - for me that was the beginning, and I knew that it was the beginning. I knew. There were a number of things that I took away from that experience, like working from the air for the first time. Even though my pictures were not very good because I didn’t have the right equipment I knew it was a way that I wanted to continue working. There were a good half dozen things that I took away from that experience that I could work over for quite a long period of time. NP: So to segue from your interest in aerial imagery and the landscape to the work that is on display right now, Library of Dust. Can you talk a little bit about that project and how you came to be doing that work? DM: This project meant a tremendous amount to me. I feel like finding this subject matter and being able to work with it was really rare. I suppose the thing that had evolved enough in me was to have the instinct, that when I read about the existence of these canisters for the first time I immediately knew this was something I needed to pursue, without even having seen them. There were a number of reasons for that. 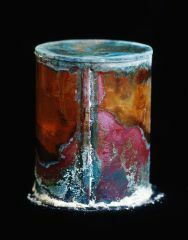 On the surface, simply having photographed copper mines and having been obsessed with the materiality of copper for so many years, and here were these canisters made of copper. I knew how mutable copper was as a material and how reactive it could be. So that was a kind of spark. Going a few steps deeper: knowing that these were psychiatric patients that had been unclaimed by their families is a moving and bizarre story in and of itself. I had also had an experience in my early 40s – I’m 48 now – in my early 40s I learned for the first time that my grandfather in the years before I was born had been hospitalized for severe depression and had had a dozen rounds of electroshock therapy. It wasn’t so much this fact that was amazing to me but it was the notion that this knowledge had disappeared from my family history and quite nearly vanished in the span of a generation. No one talked about it. He died when I was eleven, and in my lifetime he was terrific, he was quite happy. I sensed that for all these unclaimed canisters there were stories like that, and having had a close friend succumb to mental illness I saw that it can attack anyone just the same way cancer can attack anyone or you could step off the sidewalk and be hit by a bus. It’s that simple. There is a lot of shame associated with mental illness, and I thought if there is any opportunity for me to bring these canisters to life literally, it would be an opportunity to help shed some of the shame associated with mental illness. Those were the things that were operating. I think additionally minerals have been an aspect of my work sort of forever, minerals and dust. The dust from St. Helen’s, the dust from Owens Lake, the minerals in Owens Lake, the minerals in Terminal Mirage. Here was another way that the world is being revealed to be comprised of minerals. There is also this question that I had, in particular after my mother’s death, and after 9/11, of what happens when the body gets destroyed. When is something dead and when is something alive, and what do those words even mean? I think our grasp on them is really simplistic. 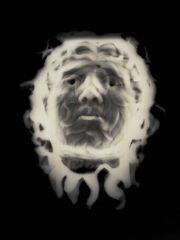 There is a kind of eradication of the human body that happens with cremation at the hospital. 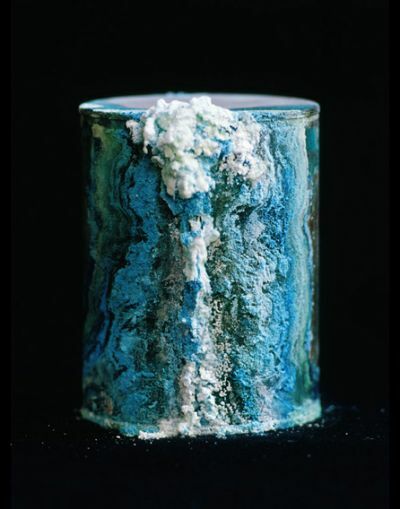 But also it’s the way that the canisters evolved and had these mineralogical blooms on their surfaces as the ashes were reacting with their housings. 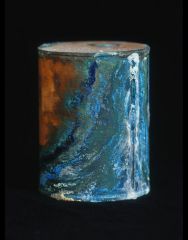 I didn’t really know all of this when I started the project, but as soon as I saw the canisters and how they conveyed this sense of being mineralogical portraits, I knew no matter how difficult gaining access to them sometimes was, that I really wanted to pursue this work. NP: That connects to the similar aesthetic quality you achieve in your images. The abstract forms that appear in your aerial work of previous projects come through these blooming surfaces of the canisters. But here you are working on a totally different scale. In addition to these other reasons that you’ve spoken about, what led you to this new approach and to working on this scale? DM: Well, I couldn’t have predicted it to be honest with you. There was a kind of synchronicity involved in terms of finding the subject matter. I too was amazed at how these objects seemed to take aerial images that I had made and state them on a completely different scale. But there is also something about the way that I’m working with these objects against black space, and also the scale that I’m printing them at, that takes the canisters’ scale and confounds it in ways that are parallel to how I’m working with the landscape subject matter. Yes, they are small objects but there are magnificent worlds within them. There was a point where early on in this project I had a print, just a small work print behind my desk, an image of one of the canisters that in fact ultimately ended up on the cover of the book. And I thought to myself, where have I seen this? I know this picture, why do I know this picture already when no one has heard about these objects before and I’ve never seen any pictures of them? It was months into working on the series when I had this kind of ‘Aha!’ moment, and I realized that in essence this image was a replication of a photograph of the earth from space that was one of those early images, from when the astronauts were heading to the moon and looked back and saw the globe of the earth against the black sky. It was a very strange moment for me where I realized that there were all of these analogues in the pictures that I might not have intended but that my working methods were building into the project. NP: You mentioned how the black background that you’re working with really contributes to a different sense of space and your use of the visual field. How did you decide on this different use of space, and how does this change resonate with you artistically and spiritually? DM: The black background has a number of different functions or different readings that you can take from it. It does read as celestial space or the night sky. This sense that the big bang resulted in all of this cosmic dust and here is another iteration of that cosmic dust. I also think the blackness reads as the past or as time from which the minerals have emerged and from which these human lives have emerged. It’s also the unknown. And then of course, as you’re saying ‘spiritually’, the black is a shroud or it’s a cloak of mourning, and there is some sort of elegiac aspect to it. What strikes me is how much space is actually contained in that blackness. It’s not a two dimensional back drop or it doesn’t read that way to me, it actually reads as having a lot of depth. Perhaps it’s because sometimes you actually see if some of the mineral encrustations have basically fallen off the canister, you can actually see foreground and so in a sense once you see foreground you can almost interpret that there’s background as well. So there are a number of different ways that it’s working, and I think the one that is most interesting for me to continue to think about and to investigate is the sense of time or the past. The blackness is somehow the kind of netherworld that you can’t fully penetrate but that contains a great deal of information. NP: The black space is something that you’ve also started to use in History’s Shadow, and so that got me thinking about the idea of the index or archive and how that’s a concern in this work and History’s Shadow. What do you feel are the implications of using photography to document and further index a preexisting archive? DM: It’s a great question and I think it’s a complicated question, a complicated relationship that photography has to the archive. I see the archive or the index as being parallel to the notion of making a map of a place, which is basically what a landscape photograph is, and that’s how I’ve worked with the aerial view. It’s an attempt to give order. There is an interesting quote, Gerhard Richter has this introduction in one of his monographs that says, “When we describe a process, or make out an invoice, or photograph a tree, we create models; without them we would know nothing of reality and would be animals.” [laughs] And it goes on, but it’s brilliant right there. There is this notion in the archive that we’re creating order, and certainly the hospital in creating an archive was attempting to give order to these lives and to these canisters with all of these different systems. There were paper labels with names, there were numbers stamped into the lids, but for all of those attempts at creating order and basically these attempts at stopping time – time doesn’t stop – and the paper labels over time didn’t last, and the numbers that were stamped into the lids – well sometimes a canister had two sets of different numbers, or sometimes the numbers might repeat from one set of cans to another. There are all of these slippages, and it’s that tension between wanting to create order and the inability to perfect any of the systems over time that really interests me. I’m fully aware that here I am making a parallel archive in a way, a photographic archive. But it’s limited, it is severely limited. There are 3,500 canisters in that room, so I’ve only photographed a small fraction of them, and there is that impossibility to stop time or to actually make a map of the world; you can’t map the entire thing, it’s impossible. And the canisters are changing still, so any image that I make doesn’t really reflect how they are in their current state. One of the ways that I wanted to grapple with that in the book was to use the numbering system in several ways. For example, the canisters in the book are in the order that they were shelved according to the numbering system, and so they move forward in that order, it’s not an order that I have created, it’s a preexisting order that the hospital created. I decided to use the endpapers to represent graphically that I was actually photographing just a very small portion of them. The first set of endpapers show the numbers of those that I photographed and there’s a lot of space around them, and the second set of endpapers lists all 3,500 canisters in that room. Then there are gaps because in fact there were more than 5,000 canisters originally and somehow over time there are already 1,500 missing. The archive is intrinsically faulty and flawed. This is very honest and very touching in the hospital’s attempts to handle these objects and try to do the right thing, and yet not ever really be able to entirely the right thing. I think that’s a human condition [laughs]. I think with History’s Shadow there are some parallels. Again I’m working in institutions that have created these archives as a kind of systematic record, but then there are differences as well. Library of Dust really triggered the History’s Shadow, and because of that the working methods are somewhat similar. There is this idea of bringing life back or finding a way through photography to bring life back to an object that was hidden or previously unseen. Even though with these artworks some of them are not hidden, I find that the process of seeing them through the x-ray brings them back to life in a really contemporary way so that we can see through our eyes from this moment that we occupy in 2010, how the essential aspects of this art that might have been made centuries or even thousands of years ago, it reconnects with that kind of spirit, and lets them be seen in a way that we can actually appreciate them again. I’ve never really had a particular affinity for artwork from antiquity, it’s the x-ray itself that lends them their contemporary charge. NP: I read in another interview that you never really stop working on a project even if it materializes as a book or an exhibition, that you tend to revisit and continue making images that add to the work as a whole. As I started to think about it I realized that this working method speaks to what you are documenting. This shifting hierarchy of forms in the world, and the sublime which is something I know you have discussed, and its relationship to this hierarchy. 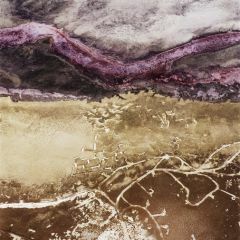 Whether it is the dust and the minerals that make up a lower level of some system of forms that rises up to these large scale aerial views and to something even larger, or if it is this thing we call the sublime, the nature of your work seems to make it particularly difficult to impose an artificial deadline. DM: That’s a really interesting way of looking at it, that’s very powerful. Time does enter into the equation and you can’t put an end to the project because of the sublime aspects of the material. It’s endless, and once it enters me – once it’s in my bloodstream – it’s there. I’ll be going back to Owens Lake periodically, I think, for my entire life. Maybe there is a way that all of these projects can continue and do continue. There isn’t really an artificially imposed ending point because how could there be [laughs]? You’re right, it’s something in the nature of both the way I’m thinking about these objects and these sites, and also just what draws me to them that is the sublime. One way that maybe the sublime gets rendered is through an endlessness, and when you think about it in terms of time, well then fine, it will take the rest of my life [laughs] to unfold these things. It just needs to continue. I like that idea. NP: The work is never really done in a way. DM: And it doesn’t need to be. Certainly to be able to bring a body of work into book form – I really enjoy it – is a great way of being able to express one’s intentions, but it’s not the end of the project by any means. I’m not photographing at the hospital right now but the hospital itself is undergoing incredible changes. They’re actually rebuilding most it now. There has been at least $150 million earmarked of what will probably be a half billion dollar project. One of the things that I’m interested in being involved with, if possible, is to advocate for the creation of a structure on the hospital campus to house these canisters, and to potentially get involved in proposing some design ideas for this. It comes full circle in a way, I’m right back at architecture. If I dare to really pursue it fully I would be dealing with all of those aspects of architecture that so interested me right at the beginning [laughs]. So we’ll see where that goes. NP: In another interview you talk about going to Maine, building a darkroom and locking yourself in there for about a year to churn out prints and work through images you made of a mining project out west. After having the formal training at Princeton, what was the significance of this kind of rite of passage? DM: It came in between Princeton and Harvard. I was about a year or two out of Princeton when I did this. Of course the hidden motivation was that I went to Maine to live with my girlfriend at the time [laughs], and the net result was there was very little work once the tourists had left. I had done a lot of work that summer, aerial mining work through the Rocky Mountain States. I made that my focus, to not only get through the work in terms of issues of processing film , making contact sheets, deciding what to print, and all that, but I really wrestled with what the work meant. What was the intent of these mining images? Was I damning this industry? I wasn’t comfortable with that idea; I thought it was a really simplistic response. At first I was kind of paralyzed. You use chemistry and rare metals in all photographic processes for God’s sakes. And with that knowledge and that willingness to be uncomfortable with it and sit with it for a long time, I realized I was looking at what comprised photography. I was looking at where the materials of photography come from, whether it’s mineralogical or whether it’s logging the forest to make paper, or water resource management. 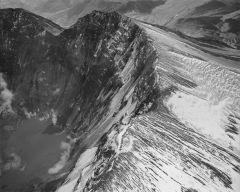 There is probably 15 years of aerial image making that on the surface is often seen as ‘Oh here comes the environmental guy’, but it’s much different then that, because I also felt we are all thoroughly complicit in making these kinds of places. That understanding and that acceptance, even with a level of discomfort, that the way that we collectively live as a society is what allows these landscapes to be used in the ways that they are, and photography is as complicit in these land use issues as well. Having that amount of time to thresh through these problems gave me a kind of grounding in the work that was invaluable.